Traditionally, plans for brick-and-mortar stores are developed through physical prototyping. But when prototypes aren't right, need to be revised or they're no longer needed, they're often thrown away or their materials are recycled. It not only costs money and takes time to have them built, but it's also not efficient from a resource standpoint. TreeHouse used to operate this way a couple of years ago. The home-upgrade retailer, which positions its offerings as "healthy and sustainable" alternatives to those found at Home Depot and Lowe's, treated its first store, located in Austin, Texas, like a "petri dish," says TreeHouse's vice president of creative and design, Aaron Moulton. They'd use it to run pilots of store displays, and then a week later, the display would be tossed. "That went on for about two months, and we went, this is kind of ridiculous, this feels like we're doing something wrong that's against the soul of the business," Moulton says of all the waste. So, they decided to change up the approach to developing stores. The executive team had been reading about the implications of virtual reality for retail store design. The idea behind it was to incorporate virtual reality to eliminate physical prototypes. Eventually they thought, why not just try it? They knew very little about the technology or where to start, but they understood that they would need software to help with modeling architectural interiors, as well as hardware, meaning VR headsets. They also knew they'd need to somehow translate models into VR. It was around this time that Moulton attended the Dwell on Design interior design conference and met some of the team from architectural VR software startup IrisVR. Their platform was exactly what TreeHouse had been looking for in a VR player. It hadn't launched publicly yet, so TreeHouse got a private beta. The platform allowed TreeHouse to drag its architectural model into VR directly, Moulton says -- in less than five minutes. It was super simple, and didn't require Treehouse to hire a VR designer, which obviously saved the company money. 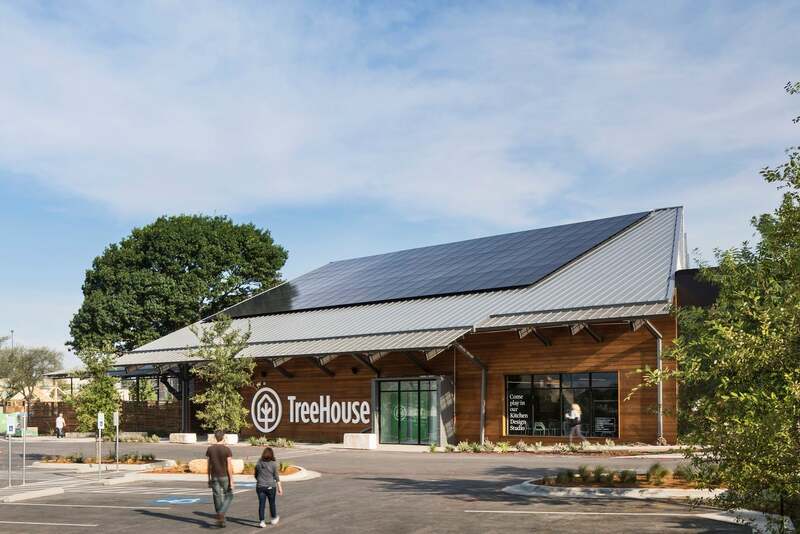 TreeHouse was gearing up to build its second store in Dallas, and the company created a virtual-reality model prior to construction. This allowed them to virtually walk through the new store before it physically existed, test out various design elements and identify flaws. For instance, during this process, TreeHouse revised plans for a staircase to the mezzanine level. The originally plan was a dense steel and wood structure, meant to evoke the interior of a tree. By using VR, the company found it blocked windows, darkened the store's core and impeded the natural daylight that illuminates the space and minimizes electricity use. 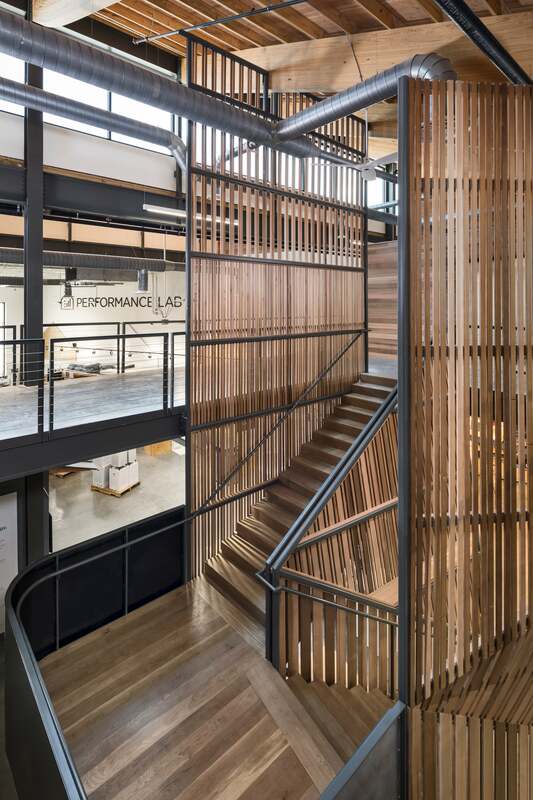 Today, the walls that surround the staircase are made up of vertical wooden slats, spaced apart to let in light. The company estimates it saved $50,000 building a simpler structure, as well as another $20,000 or $30,000 removing some unnecessary walls elsewhere in the store that made the space feel too enclosed. TreeHouse is currently planning a third store in Plano, Texas, and while plans aren't finalized, the goal is 50 stores within the next 10 to 20 years. Moulton says that the company plans to model all of its future stores in VR, and believes by doing so, the company will save tens of thousands of dollars a year now that it won't have to hire teams to build prototypes. Also, CEO Jason Ballard won't have to travel to different cities to tweak displays, further minimizing the company's carbon footprint. Another advantage of VR modeling allows is customer feedback. Pre-VR, TreeHouse couldn't have expected regular customers to join them in their conference room and mark up blueprints. But to date, the company has pulled three people from the store floor and invited each of them to don a headset and share their thoughts on planned store displays. Going forward, this one-on-one interview approach will give TreeHouse direct insights into how its customers think and shop. 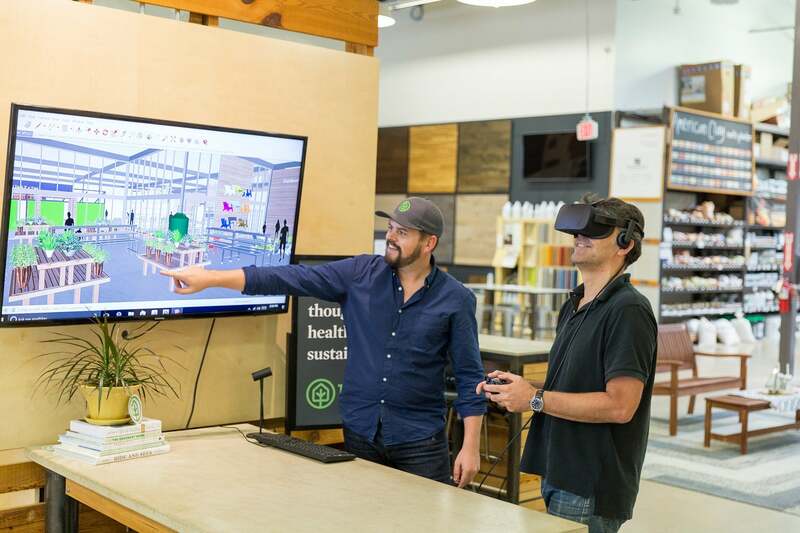 Aaron Moulton (left), vice president of creative and design at TreeHouse, helped spearhead the company's transition to using VR for store design. "VR creates a way to consume spaces that is extremely democratic," Moulton says. "When looking at architectural plans, only a select few can interpret them in their mind's eye. VR allows anyone to step into the space and have an opinion." For companies considering implementing VR for this purpose, it should be noted that "to keep things truly scaled, you're going to have to invest in a 3-D model of the environment and its elements," says Brian Dyches, director of Rex Retail and CorbisStudio, which has a division focused on creating VR visualizations for businesses. "Once you have those elements modeled, you still have to do some trickery to get them into the VR environment." TreeHouse used IrisVR to circumvent this challenge, but different companies have different approaches to creating their visualizations. Despite the learning curve and implementation challenges, Dyches believes VR is becoming instrumental in helping companies cut costs and attract talent. "In my own experience in designing store environments, the attitude was just 10 years ago was, we'll spend $600, $700 a square foot. People are still willing to spend it, but they are extremely afraid of making a mistake," Dyches says, noting the fear mindset from Great Recession still remains in today's employees. "I think that's where VR is a compelling part of the toolset, because it's going to help you refine and lessen that error." Plus, in order to recruit and retain top talent, brands have to embrace technology. "Whether it be on their tablet device or in a gaming environment, photorealism and the ability to be in a truly immersive environment is just what today's consumers expect," Dyches says, explaining that VR experiences are already beginning to involve human senses other than sight to test music, floor texture and more. "As brands recruit new and younger, more technology-savvy personnel, they're giving that generation more aggressive tools that are not only going to keep their interest, but allow them to be more refined in how they execute at the store level."